ON February 6, 2019, the United Ways of Florida’s central west coast (Citrus, DeSoto, Hardee, Hernando, Highlands, Hillsborough, Manatee, Pasco, Pinellas, Polk and Sarasota counties) announced 43% of household in the region struggle to pay for basic needs such as housing, child care, food, transportation, health care, and technology. Statewide 46% of households face the same financial challenges. On Florida’s Central West Coast, the number of households struggling to cover essentials grew by nearly 8% between 2010 and 2016. 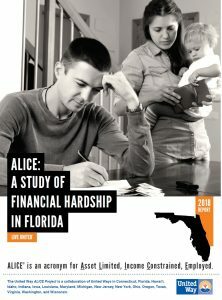 To read the report and find county-by-county and town-level data on the size and demographics of ALICE, visit www.UnitedWayALICE.org/Florida. Table 1: Data in green indicates positive movement. Data in red indicates negative movement. These struggling Floridians are Asset Limited, Income Constrained, Employed or ALICE. They are households earning above the poverty line but not enough to cover the most basic of needs like food and housing. Even Florida’s central west coasts most affordable communities, across the board increases in everything from child care to health care continue to plague a family’s ability to save or prepare for unexpected financial setbacks, even when working a 40-hour-a-week job. We saw how quickly ALICE was impacted by circumstances last year after Hurricanes Irma and Maria. After the storms passed, many businesses remained closed for extended periods, leaving families without paychecks. Couple that income interruption with unanticipated evacuation/preparedness expenses and we saw a huge increase in people reaching out for help when meager savings was depleted. The cost of basic household needs increased steadily, outpacing the rate of inflation and wage growth. The cost of household basics in Florida increased 12 percent for a single adult and 20 percent for a family of four from 2010 to 2016. At the same time earnings increased only 13 percent in Florida but the national inflation rate was just 9 percent. Florida is one of 18 states that have ALICE reports published. The research is supported in part by the Aetna Foundation, AT&T, Atlantic Health System, Deloitte, Entergy, Johnson & Johnson, KeyBank, Novartis Pharmaceuticals Corporation, OneMain Financial, RWJBarnabas Health, Thrivent Financial Foundation, Union Bank &Trust, UPS, and U.S. Venture. For town- and county-level ALICE data or to find county-by-county survival and stability budgets for six family sizes, visit UnitedWayALICE.org/Florida.